Best of all, I find that making up a big salad bowl like this is pretty economical compared to say, grilling a big chicken breast for each person to be served with a couple of sides. Instead, everything is right here - the perfect all-in-one meal during the warm summer months. One or two chicken breasts - once sliced or cubed up - go a long way towards serving several people when combined in a large salad with various other ingredients such as this. Fresh, colorful, healthful, vibrant and simple to prepare ... I urge you to try a salad bowl such as this one this summer. First, prepare the chicken. Brush breast with olive oil. Season with salt and pepper. Grill on an indoor grill pan set over medium heat - flipping once - until cooked through and juices run clear. (Internal temperature should be 165 degrees.) Remove from grill pan and immediately brush (or dab) top of chicken with honey. "Tent" chicken using foil to keep it warm until ready to serve on salad. Meanwhile, place chopped lettuce on a large platter or into a large serving bowl. Arrange strawberries, peaches, onions and avocado as desired atop lettuce. (Squeeze some lime juice over the avocado slices to avoid browning of avocado.) Lastly, thinly slice chicken and fan it out as desired across salad. Garnish salad with cilantro and lime wedges. Serve with balsamic vinaigrette (recipe shown below). Combine the first six ingredients in a mixing bowl using a fork. Drizzle in the oil, whisking with the fork to fully incorporate. 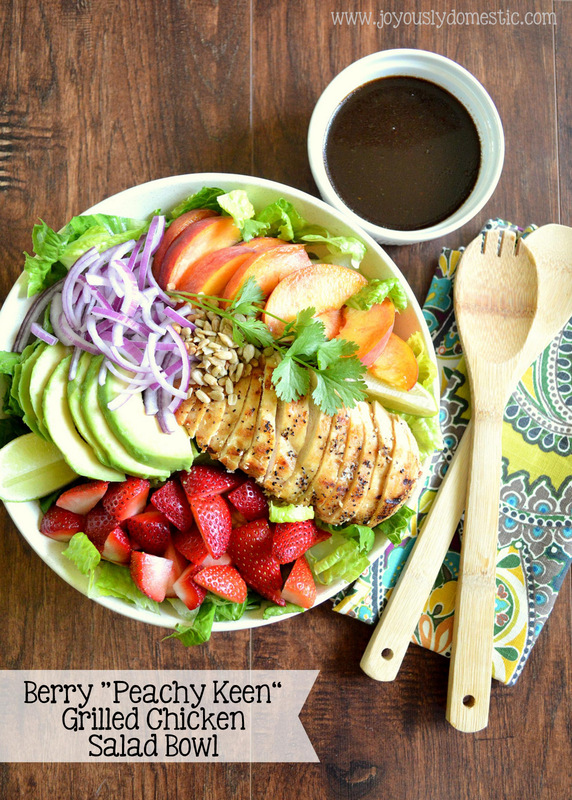 Serve over Berry "Peachy Keen" Grilled Chicken Salad Bowl. Store any leftover vinaigrette in the refrigerator in a glass jar or small bowl with a lid. Allow vinaigrette to come to room temperature prior to serving if utilizing after refrigeration. Stunning photos. Lordy, makes me want to dive right into the pic. I am thinking I am going to have to def try this recipe. Thanks n hope your summer is going good. Thanks, Brenda. This one is a real summer favorite now ... made it twice in one week! Thanks for stopping by!